During the American Civil War, the Commonwealth of Pennsylvania played a critical role in the Union, providing a huge supply of military manpower, equipment, and leadership to the Federal government. The state raised over 360,000 soldiers for the Federal armies, and served as a major source of artillery guns, small arms, ammunition, armor for the new revolutionary style of ironclad types of gunboats for the rapidly expanding United States Navy, and food supplies. The Phoenixville Iron Company by itself produced well over 1,000 cannons, and the Frankford Arsenal was a major supply depot. Pennsylvania was the site of the bloodiest battle of the war, the Battle of Gettysburg, which became widely known as the one of the turning points of the Civil War. Numerous smaller engagements and skirmishes were also fought in Pennsylvania during the 1863 Gettysburg Campaign, as well as the following year during a Confederate cavalry raid that culminated in the burning of much of Chambersburg, Pennsylvania. The industrial town of York, Pennsylvania, was the largest city in the North to be occupied by the Confederate States Army during the war. Several significant Federal leaders hailed from the Commonwealth. Military leaders from Pennsylvania included Generals George G. Meade (the victorious commander at Gettysburg and from Philadelphia), Winfield S. Hancock, John F. Reynolds, Admiral David D. Porter, and Quartermaster General Montgomery C. Meigs. Pennsylvanians also rose to prominence as political figures during the war, like Secretary of War Simon Cameron and the fiery Radical Republican abolitionist Representative Thaddeus Stevens. A small number of Pennsylvanians joined the ranks of the Confederacy, including such leaders Generals John C. Pemberton and Josiah Gorgas. Drum Corps of the 1st Regiment, Pennsylvania Reserve Volunteer Corps. Over 360,000 Pennsylvanians served in the Union Army, more than any other Northern state except New York. (Other states sent larger proportions of their population, but not larger numbers.) Beginning with President Lincoln's first call for troops and continuing throughout the war, Pennsylvania mustered 215 infantry regiments, as well as dozens of emergency militia regiments that were raised to repel threatened invasions in 1862 and 1863 by the Confederate States Army. Twenty-two cavalry regiments were also mustered, as well as dozens of light artillery batteries. The 47th Pennsylvania Infantry, one of the regiments which initially served in the Eastern and Lower Seaboard Theaters, went on to become the only regiment from Pennsylvania to both fight in the Union's 1864 Red River Campaign across Louisiana and to have men confined as POWs at Camp Ford, the largest Confederate States Army prison west of the Mississippi River. After the 47th's return to the Eastern Theater in July of that same year, the regiment then participated in a brief encounter at Snicker's Gap before engaging in the intense fighting of Sheridan's 1864 Shenandoah Valley Campaign in Virginia, including during the battles of Berryville, Opequon (Third Winchester), Fisher's Hill, and Cedar Creek. Most of the new Pennsylvania regiments were organized and trained at sprawling Camp Curtin near Harrisburg, as well as thousands of soldiers from other states. Other significant training sites were near Pittsburgh, Easton, Philadelphia and West Chester. Over 100 soldiers from Pennsylvania units would win the Medal of Honor for their actions during the conflict. Pennsylvania ranked first in the number of black soldiers (8,612) mustered into the Union Army, forming eleven regiments of U.S. Colored Troops. Most of these trained at Camp William Penn, established in 1863 north of Philadelphia, the only camp used to train Colored Troops exclusively. Pennsylvania was a critical source of raw materials to the Union's war effort, particularly anthracite coal. The commonwealth supplied all of this "smokeless" coal for the military's purposes, as well as the majority of bituminous coal also used in the war effort. Nearly 80% of all the iron for the government came from Pennsylvania foundries, as well as significant quantities of flour, meat, foodstuffs, textiles and uniforms. The Cumberland Valley was among the fertile farming regions that supplied vast amounts of food and grain to the army. The railroads became critical in transporting materiel and troops. In particular, the Baltimore & Ohio Railroad and the Pennsylvania Railroad were of importance, as well as the Northern Central Railway, which led from Harrisburg to Baltimore, Maryland, and Washington, D.C.. The Bethlehem Iron Works produced railroad rails and armor plating for the U.S. Navy's ships. The largest producer of wrought iron artillery pieces for the Union army was the Phoenixville Iron Company in Chester County, which, at its peak, churned out fifty 3" Ordnance Rifles each week. Smaller facilities produced steel swords, rifles, pistols, tools, camp implements, tents and other items used by the Federal armies, making Pennsylvania one of the most important sources of government supplies during the war. On the other side of the state, Pittsburgh's heavy industry provided significant quantities of weapons and ammunition. The Fort Pitt Works near Pittsburgh made mammoth iron castings for giant siege howitzers and mortars, among the largest guns in the world. The foundry produced 1,193 guns (15 percent of the total U.S. wartime artillery production) and almost 200,000 artillery projectiles. Other prominent Pittsburgh area factories included Singer, Nimick and Co. (maker of 3" Ordnance rifles) and Smith, Park and Co., which produced more than 300,000 artillery projectiles. Pittsburgh industries collectively manufactured 10 percent of the total U.S. wartime production of artillery projectiles. As a result of its vital role as a Federal raw material source and its proximity to the Mason–Dixon line, Pennsylvania was the target of several raids by the Confederate States Army. These included cavalry raids in 1862 and 1863 by J.E.B. Stuart, in 1863 by John Imboden, and in 1864 by John McCausland in which his troopers burned the city of Chambersburg. Fears were raised in Pittsburgh in the summer of 1863 when Morgan's Raid approached Pennsylvania before it was thwarted in neighboring Ohio. Pennsylvania also saw the Battle of Gettysburg, near Gettysburg. Many historians consider this battle to be a major turning point of the Civil War. Federal dead from this battle rest at Gettysburg National Cemetery, site of Abraham Lincoln's Gettysburg Address. A number of smaller engagements were also fought in the Keystone State, including the Battle of Hanover, Battle of Carlisle, Battle of Hunterstown, and the Battle of Fairfield, all during the Gettysburg Campaign. The city of York, Pennsylvania, became the largest Northern city to be occupied by Confederate troops when Jubal A. Early's division took control of the town in late June 1863 and extracted a ransom. Throughout the war, Pennsylvania politics were dominated by Republicans under the capable leadership of Governor Andrew G. Curtin, a strong supporter of President Lincoln. The extreme southern tier of the state included a fair number of Copperheads, particularly in Fulton, Adams, and York counties. On the national level, Simon Cameron served as Secretary of War during the early years of Lincoln's administration. Congressman Thaddeus Stevens became one of the leading voices of the Radical Republicans in Washington, and was a hawk on the war efforts and in his harsh views on Reconstruction. Stevens' Caledonia Iron Works were burned by Jubal A. Early's Confederates during the Gettysburg Campaign in direct response to his strong stance supporting scorched earth policies in the South. One Pennsylvanian soldier spoke to a Confederate slave woman whose husband was whipped, and was appalled by what she had to tell him of slavery. He stated that "I thought I had hated slavery as much as possible before I came here, but here, where I can see some of its workings, I am more than ever convinced of the cruelty and inhumanity of the system." After the Battle of Antietam in fall of 1862, thirteen Union governors assembled in Altoona, Pennsylvania, at the Loyal War Governors' Conference. 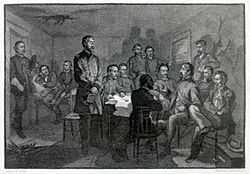 This meeting was assembled by Governor Andrew G. Curtin and its purpose was to discuss strategy, troop quotas and the Union. The governors affirmed their support towards, as well as expressed their concerns regarding the war effort and the emancipation proclamation. They then traveled to Washington, DC, to meet Abraham Lincoln and relay their conclusions to him. A few weeks later, Lincoln removed General George B. McClellan from commanding the Army of the Potomac (about whom the governors had voiced their displeasure), and issued the Emancipation Proclamation. By late 1864, the majority of Pennsylvania voters had rallied around the president and supported his incumbency in the Presidential Election, giving Lincoln 296,292 votes or 51.6% of the ballots cast versus Maj. Gen. George B. McClellan's 277,443 votes (48.4%). While the war still raged, efforts were underway in Gettysburg to preserve portions of the battlefield for future generations as a tribute to those men who fought there. Pennsylvania also took steps to preserve and record the history of each regiment and unit raised in the state, as well as the muster rolls. In 1869, the official commonwealth historian Samuel Penniman Bates wrote the monumental five-volume History of the Pennsylvania Volunteers, 1861-1865 which remains the standard reference for the commonwealth's regimental histories and unit rosters. The State Archives in Harrisburg preserves the military records of the state's emergency militia, as well as material on the state's volunteer regiments and batteries. It also houses microfilmed records of the damage claims from individuals in several counties, delineating losses of their personal property and possessions to the opposing armies during the Gettysburg Campaign. The Pennsylvania Capitol Preservation Committee maintains and preserves just under 400 of Pennsylvania's historic Civil War battle flags The State Museum of Pennsylvania houses an extensive general collection of Civil War artifacts, as well as Peter Rothermel's massive painting of the Battle of Gettysburg. The National Civil War Museum in Harrisburg is one of the country's leading interpretive sites for the Civil War, and the Visitors Center at the Gettysburg Battlefield holds thousands of artifacts, including the largest collection of vintage Civil War weapons in Pennsylvania. Other Civil War-related museums are scattered throughout the state, as well as county archives and hundreds of memorials / monuments / historical markers. An impressive state-sponsored monument in the Gettysburg National Military Park honors Pennsylvania's soldiers and leaders. Pennsylvania Monument at the Gettysburg National Military Park. Klein, Philip Shriver, A History of Pennsylvania. University Park, PA: Penn State University Press, 1980. ISBN 0-271-01934-4. McPherson, James M., Battle Cry of Freedom: The Civil War Era. New York: Oxford University Press, 1988. ^ United States. Army. Pennsylvania Infantry Regiment, 118th (1862-1865) (1888). History of the Corn Exchange Regiment, 118th Pennsylvania Volunteers, from Their First Engagement at Antietam to Appomattox: To which is Added a Record of Its Organization and a Complete Roster. Fully Illustrated with Maps, Portraits, and Over One Hundred Illustrations. J. L. Smith. pp. 652–. ^ Bates, Samuel P. "History of Pennsylvania Volunteers, 1861-5, Prepared in Compliance with Acts of the Legislature." Harrisburg: B. Singerly, state printer, vol. 1, pp. 1150-1190, 1869. ^ Schmidt, Lewis G. "A Civil War History of the 47th Regiment of Pennsylvania Veteran Volunteers." Allentown: Self-published, 1986. ^ Snyder, Laurie E. "Red River Campaign (Louisiana, March to May 1864)," in "47th Pennsylvania Volunteers: One Civil War Regiment's Story." Retrieved Online, April 2016. ^ Prisoner Records, Camp Ford. Tyler: The Smith County Historical Society. ^ Smithsonian Institution (29 October 2013). Smithsonian Civil War: Inside the National Collection. Smithsonian Institution. pp. 477–. ISBN 978-1-58834-390-1. ^ Sean Patrick Adams (29 December 2010). Old Dominion, Industrial Commonwealth: Coal, Politics, and Economy in Antebellum America. JHU Press. pp. 25–. ISBN 978-1-4214-0051-8. ^ Lora Schmidt Cahill; David L Mowery (20 November 2014). Morgan’s Raid Across Ohio: The Civil War Guidebook of the John Hunt Morgan Heritage Trail. Lulu.com. pp. 46–. ISBN 978-0-9898054-3-8. ^ Leip, David. "1860 Presidential Election Results". Dave Leip's Atlas of U.S. Presidential Elections. Retrieved July 27, 2005. ^ Vertical files of the Library of the Gettysburg National Military Park, citing several primary sources. ^ McPherson, James M. (1997). For Cause and Comrades: Why Men Fought in the Civil War. New York City, New York: Oxford University Press, Inc. p. 118. ISBN 0-19-509-023-3. OCLC 34912692. Retrieved March 10, 2016. I thought I had hated slavery as much as possible before I came here, but here, where I can see some of its workings, I am more than ever convinced of the cruelty and inhumanity of the system. ^ Erik J. Engstrom; Samuel Kernell (27 October 2014). Party Ballots, Reform, and the Transformation of America's Electoral System. Cambridge University Press. pp. 166–. ISBN 978-1-316-16513-3. ^ Leip, David. "1864 Presidential Election Results". Dave Leip's Atlas of U.S. Presidential Elections. Retrieved July 27, 2005. Bates, Samuel P., Military History of Pennsylvania, Philadelphia: T. H. Davis & Company, 1876. Black, Samuel W., ed. The Civil War in Pennsylvania: The African American Experience (Pittsburgh: Pennsylvania Heritage Foundation, 2013). 239 pp. heavily illustrated. Sauers, Richard A., Advance the Colors: Pennsylvania Civil War Battle Flags, Harrisburg: Capitol Preservation Committee, 1991. Duties of the Color-Guard (including description of Color-Salute procedures), in 47th Pennsylvania Volunteers: One Civil War Regiment's Story, retrieved online May 1, 2017. Francis Rupert Letters. Available online through Lehigh University's I Remain: A Digital Archive of Letters, Manuscripts and Ephemera. Rupert served in the 2nd Regiment of the Pennsylvania Cavalry, 59th Volunteers. This page was last edited on 24 September 2018, at 22:29 (UTC).